Shiloh (meaning A Place of Rest) is just that and so much more. This log home nestled in the woods overlooking downtown Gatlinburg & the surrounding mountain side is truly one of a kind. Just beyond Baskins Creek at traffic light #6 in Gatlinburg, the cabin is just a short 0.4 mi walk to downtown and all the attractions, shopping, and dining this great mountain town has to offer. Shiloh offers 2 LCD TV's a 46" in the living area with a DVD/VCR, a 26" in the Master Bedroom along with a King Size bed and private bath with Jacuzzi tub, the deck off of the main level offers wonderful views of Gatlinburg, a sitting area and a relaxing hot tub. The upper level boasts a 2nd bedroom with King Bed and private bath as well as a sitting area, the lower level offers a 3rd bedroom with a King Bed and a sitting area with a pub table. TV and an XBOX, don't forget to bring your games. Don't miss your chance to stay just seconds from downtown Gatlinburg. This was our first experience staying in a cabin. We had a wonderful time, such a beautiful cabin! So much more room and so much more comfortable than staying in a motel. We will definitely be staying with you again!! Love the cabin awesome stay, the hills was a bit of a challenge but we really enjoyed it. We love staying at Shiloh!! We enjoyed our stay in " Shiloh ". It was truly a place of rest. Hopefully, this was just one of many visits to Patriot Getaways. Thanks! We had a great time...love the cabin! All of our party really enjoyed the stay. It was a beautiful cabin! Lot's of room and plenty of room for more if we needed. I would stay again. I liked that we were able to walk to town without having to pay for parking. I wish there was more kitchen towels. But outside of that it was a wonderful vacation. We had a wonderful vacation with both our adult daughters and their families. The cabin was perfect for us, our youngest and her spouse who are expecting stayed in the upstairs 3rd floor master which worked for her daily naps. Our oldest with her spouse &19 month old son took the downstairs 1st floor master which gave them space and privacy, a place for his portable crib(he also took daily naps). We stayed on the 2nd floor master and enjoyed being where everyone gathered near the large open living room dining/kitchen area. Each floor has it's own private deck and we enjoyed eating out on the 2nd floor deck, it has a nice patio set & beautiful view. Just one minute drive to downtown Gatlinburg but still in a beautiful mountain setting. We spent my 50th birthday weekend in this beautiful cabin. This was one of the very best parts of an amazing weekend. It is very well laid out, equipped, furnished etc. It is practical as well as lovely and my family and I enjoyed it to the fullest. Wewould love to return to Shiloh. It reminded us of being together at our family cottage in Canada when the kids were young. That is a priceless feeling. Loved the chalet, it was cute & cozy. The location was great. The Cabin is located in a perfect place to access all of the attractions. It was very clean and exactly how it was described on the website. We had a great time, and when I go back I will definately check with APG again. Thank you. Our experience was wonderful!!!! From the first phone call to obtain information to the moment we checked out. We would love to come back!!! Upon arrival, the heat was not on and the cabin was very cold. We called the customer service desk and was told a maintence person would be there soon. After waiting a while, we called back and spoke to Jim. We was very helpful and offered to relocate us to another cabin. 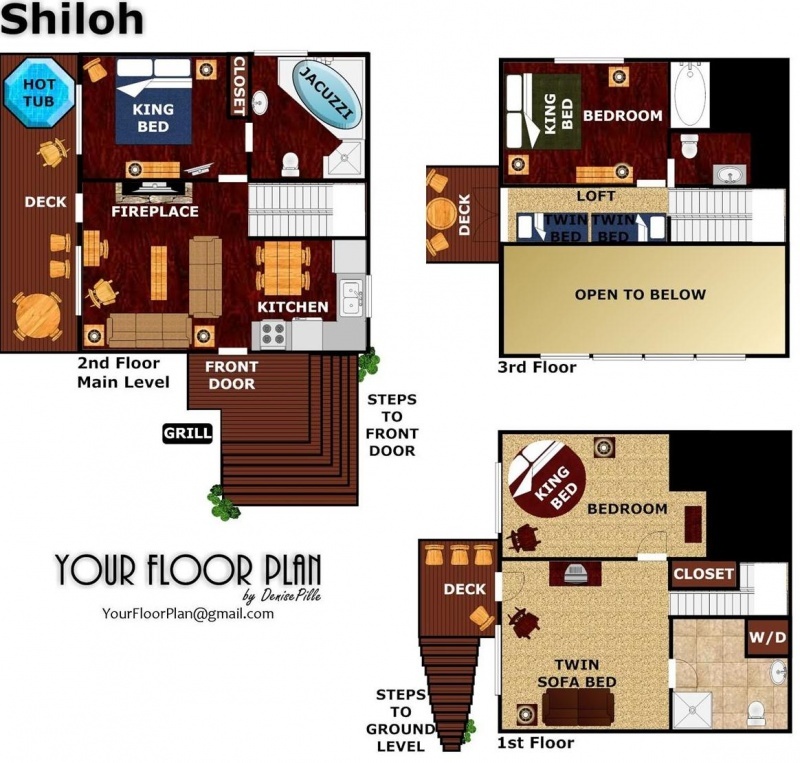 We moved to "Shiloh" and was extemely pleased with this property. My family and I would like to personally thank Jim for his help, his kindness and professionalism and making our stay with APG another great experience. See you next time.